The recently erected sculpture close to Bangor Abbey. 4 metre high sculpture the ‘Bangor Bell’ (officially named Fluctus Angelorum) which is sited close to Bangor Abbey. The sculpture was commissioned by Ards and North Down Borough Council to commemorate the journey of St Columbanus from Bangor via France and Switzerland to Bobbio in Italy 1,400 years ago. 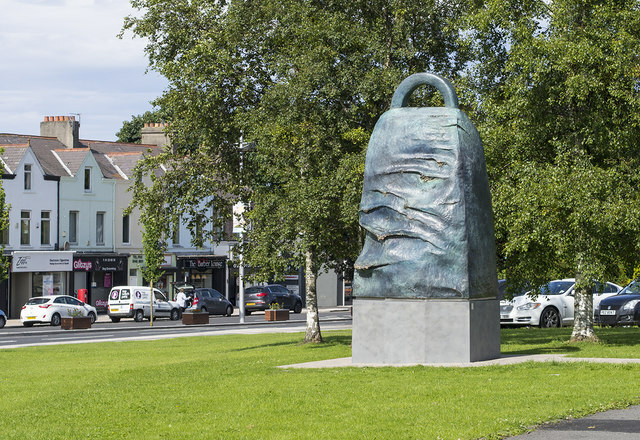 It was created by Cork based sculptor Holger C. Lönze and is modelled on the ninth century 35cm high hand-held ‘Bangor Bell’ which was unearthed at Bangor Abbey in the late 1700s, and which is now kept at the North Down Museum.